Coal fired power plants produce 50% of the 5500 tons of mercury released into the environment each year. Mercury exists in three forms throughout the world: metallic element, inorganic salts, and organic compounds (methyl mercury, ethyl mercury, and phenyl mercury). Since elemental mercury has a low boiling point it can travel long distances and deposit into the soil and water. The elemental mercury is then transformed by microorganisms into methyl mercury. Methyl mercury then biomagnifies as it moves up the aquatic food chain. Human exposure is primarily connected to the consumption of contaminated fish. In order to better understand the effects of consuming fish that have consumed methyl mercury, three epidemiological studies were completed. The studies examined children exposed to methyl mercury in utero at concentrations similar to the current U.S. exposure levels. The first study observed that children born to women with maternal hair mercury concentrations greater than 6μg/g exhibited a 3 point decrease in their IQ score. The other two studies' verified these results. The studies also found that delayed brainstem auditory responses occurred at levels of 3.2μg/L of mercury in cord blood. Recent data illustrates that cord blood mercury concentrations have increased 70% since the 2003 studies. In the Faroes case study from 2004, the researchers found fetal blood mercury levels were 30% higher than their mother's blood concentrations. Even though there is no evidence validating a threshold blood mercury concentration that has no adverse effect on the brain's cognition, the EPA set a benchmark dose level (BMDL) of 58μg/L. This level corresponds to the lower limit of the 95% confidence interval. It is important to mention that the studies observed developmental effects at levels of 1 ppm mercury in hair, or 5.8μg/L of mercury in cord blood. The National Health and Nutrition Examination Survey recently discovered that 15.7% of American women have total blood mercury concentrations greater than 5.8μg/L. Based on this data, between 316,588 and 637,233 babies are born with cord blood mercury levels greater than 5.8μg/L. This number continues to increase every year. The Faroes study examined the effects on a person's IQ when mercury concentrations are doubled. The lowest concentration tested was 4.84μg/L, and then doubled from there. The test results showed that doubling of concentrations produced a range of IQ points that averaged a 2.4 point decrease. The test then calculated the costs associated with the cognitive effects of mercury exposure. It determined that every IQ point lost among men resulted in a 1.931% decrease in lifetime earnings. In women there was a decrease of 3.225% total lifetime earnings for every IQ point lost. With the increases in blood mercury level, future generations will continue to be affected. Hydrofluoric acid (HF) for oil burning EGUs only Past numerical limits for dioxin and furan in new and existing coal and oil burning EGUs are being replaced by work practices requiring annual performance tests and tune-ups. Oil burning EGUs can show compliance for HCl and HF by limiting the moisture content of the oil used. To ensure compliant performance, the EPA requires semi-annual reports and initial notifications of compliance for each unit no later than 120 days after the facility has become subject to MATS. The regulation also requires detailed records to be kept for: each instance that an EGU did not meet an emission limit or work practice standard, daily hours of operation for each EGU, results of all performance tests, and notifications of planned performance testing. If continuous emissions monitoring systems (CEMS) are being used to measure compliance quarterly, monitoring summaries should be submitted. 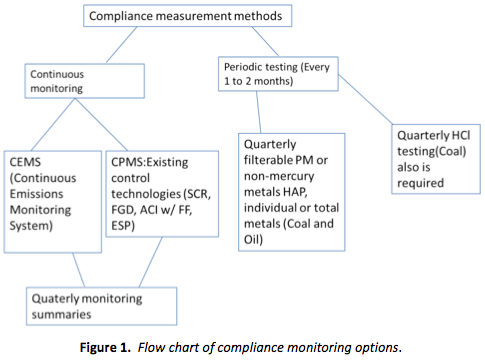 The following options for Coal-burning EGUs mercury emission limit compliance monitoring is broken down in Figure 1. Implementation deadlines are dependent on which state the plant is located in. Table 1 provides the limits for the coal-burning power plant emissions. There are three forms of Mercury present in coal-burning power plant systems: particulate mercury, oxidized mercury (Hg2+), and elemental mercury (Hg). Only particulate and oxidized mercury are captured by existing Air Pollution Control Devices (APCDs). One method for mercury control is Activated Carbon Injection (ACI) and particulate control. Another is wet Flue Gas Desulfurization (FGD) scrubbers and Selective Catalytic Reduction (SCR). An electrostatic precipitator (ESP) also helps to capture particulate matter. Both ACI and FGD methods use Oxidation Reduction Potential (ORP) sensors to monitor the oxidation of the mercury. After the combustion reaction in the boiler, the byproducts released move through an electrostatic precipitator (ESP) where some particulates are filtered out. The byproduct of combustion is called flue gas. Flue gas contains water vapor, carbon dioxide, nitrogen, particulates, oxygen, carbon monoxide, nitrogen oxide, hydrocarbons, sulfur oxide (SOs), and mercury. After the flue gas passes through an ESP, the gas goes into a wet FGD scrubber. A scrubber is composed of technologies used to remove "scrub" (SO2 and particulates) from the stack emissions of power plants. An important part of the scrubbing process is known as stripping. Stripping is the dissolution of gas from the fumes into a liquid composed of water and a calcium additive (most likely limestone). Random packing can be used inside the scrubber to force the gas to form smaller bubbles that float up while liquid flows down. This provides for optimum contact of liquid with the gaseous bubbles. The liquid traps the contaminants in the gas and allows the clean gas to escape. The higher the gas floats the cleaner the gas is and the less liquid it contacts. Figure 2 below illustrates the scrubbing process. The stripped contaminated gas is collected, concentrated, and reduced at the bottom of the scrubber with the liquid from the sprayers. After limestone reacts with the SO2 gas, a liquid form of calcium sulfite or calcium sulfate is produced. The liquid sludge will settle out and the water will be reused. The wet solid sludge is an off- white color with a five to ten percent solid content. Since some of the solid is in the form of fly ash, some systems will use fly ash removal systems. After determining the ratio of calcium sulfite to sulfate the best treatment process can be determined. The amounts of calcium sulfite to sulfate vary depending on the process and the sorbent material. Sludge with high concentrations of sulfite has to be treated because it is thixotropic. Thixotropic compounds appear to be solid, but when vibrated or agitated will liquefy. Because of this, calcium sulfite does not filter very well. Forced oxidation, dewatering, and/or fixation/ stabilization are all treatments that could be used. After being treated, most scrubber sludge is stored in landfills and holding ponds. Some products come out of the treatment process like gypsum; which is used in wallboard production1. The entire sludge treatment process is illustrated in Figure 3. Soluble oxidized mercury will precipitate in the FGD scrubber allowing it to be separated easily. The scrubber also helps with the emission control of acidic gases produced in the combustion process. In addition, a fabric filter can help capture particulate matter of toxic metals including mercury. However, even with all of the APCDs, mercury emissions still may not be reduced to required levels. Therefore, ORP and temperature sensors are needed to monitor and regulate the efficiency of the oxidation process. Oxidation Reduction Potential (ORP) is a measure of the strength of the oxidizing agent or the reducing agent of a solution. The reducing agent donates electrons while the oxidizing agent acquires electrons. This transfer of electrons is called an oxidation-reduction (redox) reaction. ORP measures the ratio of electron activity for the oxidizing and reducing species in a solution. This ratio indicates the solutions ability to oxidize or reduce another substance. It does not determine the concentration of the predominant oxidizing or reducing agent. The speed of the ORP sensor's response varies depending on the concentration of the redox system; high concentrations are faster to respond than lower concentrations. Maintaining stable ORP values will prevent mercury re-emission. A positive ORP reading of the slurry reduces re-emission of mercury because elemental mercury will be more easily oxidized into Hg2+. There are other factors in the coal burning process that can affect the oxidation process. One of these is coal with a higher chlorine count which produces less elemental mercury. Another is unburned carbon which can absorb vapor phase mercury to form particulate bound mercury. Oxidation of Mercury happens between the temperatures of 850 degrees Fahrenheit to 300 degrees Fahrenheit. Finally, the temperature gradient across an air heater can affect oxidation. Table 2 shows the state of mercury at various ORP measurement levels. Depending on installation requirements there are a couple of different options that can be considered. Yokogawa's Hot-Tap retractable allows for removal from the process without interruptions or shut- downs. Without any special tools that PR10 can be retracted safely from the process up to 5 bar. The retractable is equipped with a integrated protection cage and a built in scrapper to avoid contamination of the fitting. (A) Traditional Reference system: The Hamilton EasyFerm Plus VP, part number 238999-3067, is an all-in one design that will measure pH, ORP and temperature at the same time. (B) Differential Cation Reference System: The SC24V offers benefits over the traditional reference system since there is no junction to be clogged or coated, no electrolyte to be depleted, and no Ag/AgCl reference element to become poisoned. The SC24V will measure pH, ORP and temperature at the same time. For more information on differential cation reference system, please refer TechNote TNA1304 or Application Note PH-A-011. Yokogawa's family of all-in-one wide body combination sensors hold four separate measuring elements in one unbreakable and chemical resistant body. The FU20 and FU24 will measure pH, ORP and temperature at the same time. The construction of the Ag/AgCl reference system with double junctions and polymerized saturated KCL fill solution along with the Ag+ ion trap extend the life of the probe. This option allows for easy installation with either a 3⁄4" NPT or 1" NPT threaded process connection. EPA is now regulating mercury, as well as other pollutants produced from flue gas, to reduce pollution and prevent health issues. Coal and Oil-burning EGUs larger than 25 megawatts will have to monitor emissions and take the necessary actions to reduce the levels of mercury and air toxics. 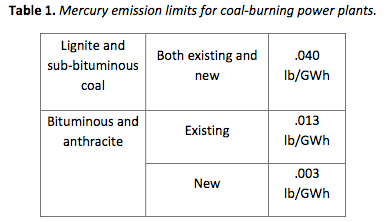 Mercury emission limits were set for new, existing, and different ranks of coal which can be found in Table 1. There are two methods of compliance: continuous monitoring and periodic testing. Scrubbers are currently used to treat the flue gas produced from coal combustion. Scrubbers can efficiently reduce emissions by maintaining optimum ORP ranges to prevent mercury re-emission. Yokogawa provides several types of ORP sensors that could be used[ monitoring ORP in power plants to reach compliance with MATS. United States of America. Environmental Protection Agency. Fact Sheet: Mercury and Air Toxic Standards. N.p., n.d. Web. 8 July 2014. "Mercury and Air Toxics Standards (MATS) for Power Plants." EPA. Environmental Protection Agency, 26 Nov. 2012. Web. 08 July 2014. Yokogawa Corporation of America. 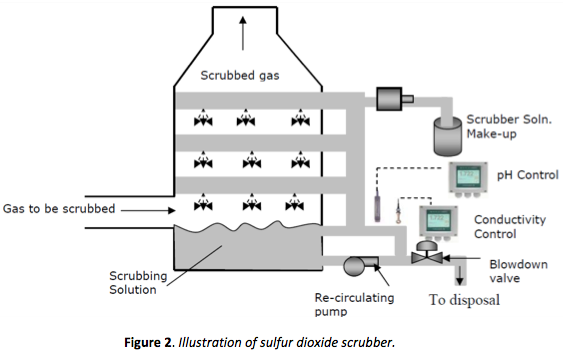 Application Note: Sulfur Dioxide Scrubber: PH Control. AN 10B01B02-23E- A. N.p. : Yokogawa, n.d. Print. "ORP as a Predictor of WFGD Chemistry and Wastewater Treatment - POWER Magazine." POWER Magazine. N.p., 01 July 2013. Web. 08 July 2014. "User Guidelines for Waste and Byproduct Materials in Pavement Construction." US Department of Transportation Federal Highway Administration. N.p., 23 Apr. 2012. Web. Cooper, Pe, Bcee Golder Associates, Inc., Ivan, and Ron Ruocco, PE, Golder Associates, Inc. "Wastewater Treatment for Flue Gas Desulfurization (FGD) at Electric." 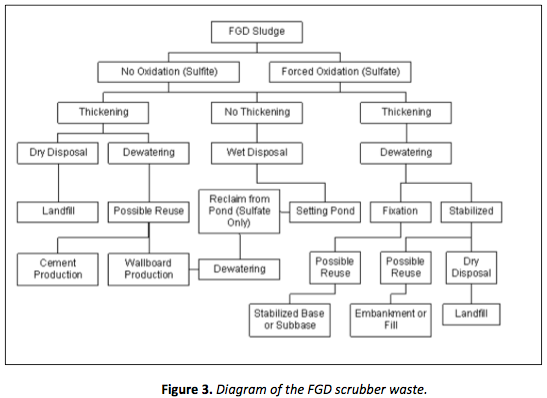 Wastewater Treatment for Flue Gas Desulfurization (FGD) at Electric Power Plants (n.d.): n. pag. Web. 8 July 2014. Controlling Mercury Emissions from Coal-fired power plants Leigh Energy Update February 2010, Vol. 28.No. 1 (2010): 1-2. Leigh Energy Update. Feb. 2010. Web. 8 July 2014. Grandjean, Philippe, Hiroshi Satoh, Katsuyuki Murata, and Komyo Eto. "Abstract." National Center for Biotechnology Information. U.S. National Library of Medicine, 08 June 2010. Web. 08 July 2014. "Edit Content Edit Classification Publishing Workflow Featured Settings Delete Content Minamata Disease." Minamata Disease. N.p., 14 Dec. 2009. Web. 06 July 2014. Plataforma SINC. "Exposure To Low Doses Of Mercury Changes The Way The Arteries Work." ScienceDaily. ScienceDaily, 27 October 2008. .
Wu, Cheng-Li, Yan Cao, Cheng-Chun He, Zhong-Bing Dong, and Wei-Ping Pan. "Study of Elemental Mercury Re- emission through a Lab-scale Simulated Scrubber." Fuel 89.8 (2010): 2072-080. Web. 8 July 2014. . The PH20, FU20 and FU24, all-in-one pH and ORP, sensors show how Yokogawa applies the motto "Simple is best" to sensor technology. The cation differential pH and ORP sensors were designed for difficult applications where conventional sensors are ineffective. These include measurements such as brine solutions to applications as diverse as electrolysis processes and cheese manufacturing. The immersion fittings are designed for either pH or ORP (Redox) measurements in tanks, open vessels and drains. They have a "hoisting cable" for easy maintenance. The heart of a pH measuring loop is the electrode system. Yokogawa has designed a wide range of electrodes to ensure this heart keeps beating under the most severe conditions. Buffer solutions are needed as an indispensable tool for maintaining an accurate pH measurement. Buffer solutions are used as references points for calibration and adjustment of pH measurements to compensate for aging and deterioration.